In this July 16, 2015 file photo, Bruce Schillin exhales vapor from an e-cigarette at the Vape Spot in Sacramento, Calif. Allegheny County officials are mulling an indoor vaping ban and heard public feedback on Monday. 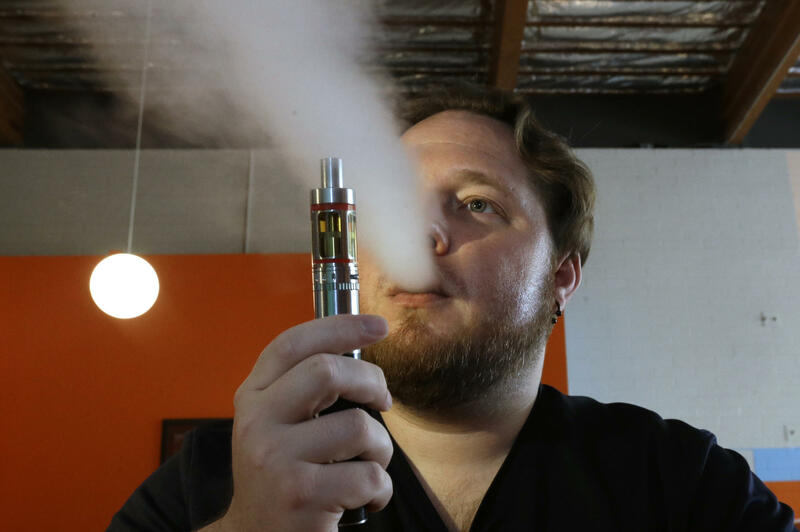 Ryan Huntermark, 21, opposed the regulation and said e-cigarettes helped his health. He told county health officials he started smoking cigarettes when he was 16 and that switching to vaping helped him quit. “It was life changing to be able to run around with my daughter without having to catch my breath for the first time,” said Huntermark, who now works at Monster Vape in Shadyside. But Brian Primack said that transition can go the other way, too. He’s a professor of medicine at the University of Pittsburgh and said the palatable flavor of vaping makes it easier for teens to try. “Many high quality longitudinal studies confirm that after these youth experiment, they are at much higher risk to transition to traditional cigarette smoking, even if they never intended on smoking traditional cigarettes in the first place,” said Primack. Primack said the pervasive use of e-cigarettes can normalize the behavior of smoking. That idea is something Allegheny County Health Director Karen Hacker cited as one justification for further regulation. Primack testified that the bulk of available data show the adverse health effects of second-hand exposure to vaping. “If we want to protect waiters, bartenders and patrons from these carcinogens when they come from cigarettes, I think we also ought to protect them if the toxins come from e-cigarettes," he said. Several owners of Allegheny County vape shops attended the hearing to ask the board to reconsider the measures, that owners said put their businesses at risk. Exemptions from the regulations would apply to those places also exempt under state law, such as casinos, private clubs, tobacco shops and some bars. In 2014, Allegheny County found that of teens between the ages of 14 and 19, 20 percent had tried e-cigarettes. The Allegheny County Health board will likely vote on the measure at its November meeting.